Eskaton Village Grass Valley was clean and professionally run. The staff was courteous, seemed very knowledgeable, and helpful. All in all, I was impressed with the facility and the personnel. My mom says the food is good. They have field trips, and they have quite a variety of activities. Theyre awful pricey though. Michael, Thank you for your review and kind words. We take great pride in our community and strive each day to create a wonderful place for our residents and staff to live and work. Our aim is to deliver high quality care and service at a competitive price. Eskaton is a nonprofit provider of senior services and 2018 marks our 50th year serving Northern California. My five stars are for the sales office, the clear communication and extra-mile helpfulness of Lynette and Yvonne. I researched this facility for my in-laws, impressed by Eskaton's many 5-star reviews. Sales teams can be aggressive giving you the upsell, but they were fast, thorough, and up-front in answering my many questions, gave a clear sense of the range of their options, and ultimately referred me to another nearby quality facility that might be a better fit. If you are at all curious about the place, I strongly recommend giving them a call. Thank you for taking the time to visit us. We appreciate the recommendation. I love it here. I've been here for 8 years. They keep us very active. There is always something to do, and the staff goes out of their way to help us whenever we need anything done. They are always polite and friendly. They treat us well. They are very courteous. They do anything we want, we get within reason. It's a great place to be. It's home to me now. Seven years at Eskaton Village Grass Valley. I always felt that my dad was happy and well taken care of here. My grandmother is so happy at Eskaton Village! We love visiting her and being greeted by the friendly staff. I was very happy with how well Eskaton treated my grandmother, it is a caring, positive place and our family couldn't be happier. Beautiful community, by far the best I've toured! I recently moved my 89-year old mother into an assisted living apartment in the Lodge at Eskaton Grass Valley. From our first interaction, the staff have been great to work with; professional, caring, and thorough. The entire operation is first class and I think my mother is in a great situation with real caregivers. Dan, Thank you for the kind words. We aim to provide the best care possible. As a nonprofit, Eskaton's vision is to Transform the Aging Experience and our mission is to enhance the quality of life of seniors through innovative housing, health care and social service. Please always feel free to provide feedback to how we can better care for your mom. I was very impressed with Eskaton, and we don’t live far from it. It just seemed they had more available all around, but I guess it depends on the condition of the person who’s there and if they have any memory of what’s going on. Eskaton would be great for people who want to remain active because they have a swimming pool, and there seems to be quite a few buses going everywhere into town. And they are right next to a high school which has activities, plays and music, and a theater. If it was me going into one of those places, I would probably take Eskaton. I didn’t eat a meal there, but it seemed like the menu was interesting, and they were really working on having good food. Thank you Cynthia for the wonderful review. We've been recognized over the last 12 years as the best community by the reader of the Union newspaper and this makes both our residents and staff very proud. We are happy to hear you've had a 5 Star experience at our community too. Please join us for lunch by calling Yvonne at (530) 273-1778. Eskaton Village Grass Valley had a nice entrance. The residents seemed to be nowhere in sight and off doing something. The rooms were OK. The dining area had a really nice view of the grounds. They had a movie room, library, and salon. Jim, Thank you for taking the time to post a review. If you have a moment, please take a look at the activity calendar http://www.eskaton.org/PDFs/calendar-village-grass-valley.pdf. Our resident like to keep busy and often take advantage of the outings. There are also daily fitness classes, so make sure to check out the fitness center next time. We look forward to seeing you again. Thank God we came to Eskaton Lodge in Grass Valley! It was Christmas. My husband was having trouble walking and I couldn’t handle alone. We signed up for a 3-month “respite” and settled into a lovely, spotless apartment where we could be together. I was still my husband’s caretaker but I had help when I needed it. Eskaton nurses connected with our doctor. They helped us call in PT & OT. We had wonderful meals, a comfortable bed, and were surrounded by cheerful, loving caregivers, and friendly residents. In spite of all the help, my husband continued to decline, but at least we were still together. We extended our stay past the 3 month respite period. When it was time the nurse called in hospice to make my husband comfortable, our family members arrived to say “good bye”, I was able to order lunch delivered to our room - for 12! And, Eskaton set tables together in the dining room so we could eat together. Thank you Eskaton for making a difficult time in our lives as smooth as possible. Our heart goes out to your and your family. I’ve moved my mom into Eskaton Village Grass Valley and am very happy with it. They have a medical staff that will administer her medications. She has her own apartment, so she can be left alone as much as she wants and still feels independent. She only calls when she needs assistance. Right now, she has been wanting to stay in her room and watch TV, so that’s better than trying to force her into a community situation where she is going to be depressed. I wish she would socialize, but the action is there, so when she wants to socialize at least it’s there. I like that she has her independence still and has her own space, apartment, and bathroom. I also like that they bring her meals to her room when she is not making it to the dining room. She has a little kitchenette, so if she wants something special, I could fix her something right there without bothering the kitchen. I think they’re great. It is a very well-organized business. The staff is very caring and impressive. This place really feels like it is there for its residents. It feels very homey and very comfortable. Thank you Jeanette for the lovely review. The brilliant part of community living is that older adults can have their privacy and be social. Too often older loved ones become isolated in their own homes which can lead to a decline in health. Eskaton residents can choose to be social, or enjoy a quiet space of their own, and their independence remains intact without being isolated from the services they need to have a good quality of life. Thank you for choosing Eskaton. Eskaton Village was very nice, large, and clean. The rooms were much too large for my friend, as she doesn’t get around too well. It was newer and more modern, but it didn’t have a homey feeling. I rate it as a 5, but it just wasn't a good fit for my friend. Eskaton Village was actually the one that was most impressive to me for my mom. My mom really liked this facility. This was the one that she thought was the best, but it was a lot more expensive. They had a lot more to offer. Their rooms were similar to the other facility. The one difference was that the kitchens at Eskaton Village were full kitchens, and that was a nice feature. The staff was great both in the tours and follow-up phone calls. They're exceptional. Activities would be a 5 because they were the standard that I was looking at. They have art classes. The facility has a swimming pool, and they have aquatics program too. It was just top-of-the-mark. Also, it was in a secure location in the woods, and their food was great. We liked Eskaton Village. If my parents both survive, they may end up here. The staff was nice and plenty of them giving lots of attention to residents. The small size of it was a plus. My parents’ friends were there, so they already have a favorable impression of it. My wife and I visited and we liked pretty much everything about it. The grounds were beautiful. They have an attentive staff and happy residents. Everything was clean and the apartments were nice. It was great and probably the best we've seen. They had organized activities and field trips. My relative is Eskaton Village Grass Valley. The staff is very professional, very well trained, and she is very much happier there than she was in the previous place. The apartments are beautiful and spacious. She is in a small apartment, but it is very comfortable for her needs. They have all manner of apartments available because some of the people there are not there for illness, but they are just there for retirement. So, there is a wide variety of people, activities, and rooms. It is just less focused on illness and more focused on activities and preserving memory and all that. The food is excellent. The chef is wonderful. They have very fresh well prepared food. The activities are planned for different levels of ability. All of the staff people are professional in their chosen area. So, it is well planned and well designed. It is one of the nicest I have seen. Eskaton Village Grass Valley was nice. However, it's really large, and the location wasn't convenient. The staff was fine, and we saw the apartments, but it was far from stores and doctors. They showed us the library and where they provide exercise and arts and crafts. I've been here three and a half years, and I am very content. Eskaton Village has been a real comfort for my mom. She's met new friends and enjoys the activities. Thank you to the staff! I toured the Grass Valley Eskaton thinking of placement for my mother. I found the facility and staff top notch. I'm sure this community is going to be a perfect match. I love it here! I'm very happy at Eskaton Village Grass Valley. I'm gonna stay here. There's a lot of activities. People are very friendly. Employees treat me wonderfully. I feel at home. Mrs. Foster, we are so happy to hear you love it here at Eskaton Village Grass Valley. It's your home and we work here to make your life comfortable and full of joy. The employees are well-mannered and always pleasant when asked to do some particular errand or work for you. My husband and I came to the "Yes I Can!" seminar at Eskaton Village Grass Valley. After the seminar, we asked for a tour of the community. Yvonne showed us around and answered all of our questions. She is so cheerful and efficient; truly she is outstanding! I own a real estate business and I would love to recruit her to work for me. My husband and I will return to Eskaton Village Grass Valley! Barbara, thank you for visiting Eskaton. Yvonne was very pleased to hear your raving review. Unfortunately, we value her too much to allow you to recruit her. Keep coming back, you and your husband are always welcome. Been here 1 1/2 years. Made a lot of nice friends and I am very happy here. All of the staff has been very friendly and accommodating. Thank you Lois for the kind words. Our staff appreciate it very much! Eskaton Village had everything. They had two-bedroom and one bedroom apartments with rooms like hospital rooms. The staff was great. The food was good. It was a nice, clean facility. Thank you for your review. If you didn't get a chance to tour all four floor plans, check them out here: http://www.eskaton.org/village-grass-valley/floorplans.html. Nestled in tree-covered hills, Eskaton Village Grass Valley (A Multiservice Retirement Community) meets the preferences of seniors seeking maintenance-free living in an historic foothill location. Eskaton Village Grass Valley is situated on 42 acres in a quiet residential area but within a short distance of medical, shopping and recreational resources. It is adjacent to the Litton Trail for those who enjoy extended walks. A shared boundary with the Nevada County campus of Sierra College provides easy access to educational opportunities. Several churches are close, and a golf course and tennis club are nearby. Eskaton Village Grass Valley has 57 assisted living apartments that provide personal care and medication management as well as hospitality services (meals, housekeeping, laundry, etc.) Monthly fees are based on each individual's need for assistance. Eskaton Village Grass Valley (a Multiservice Retirement Community) is situated on 42 acres in a quiet residential area but within a short distance of medical, shopping and recreational resources. It is adjacent to the Litton Trail for those who enjoy extended walks. A shared boundary with the Nevada County campus of Sierra College provides easy access to educational opportunities. Several churches are close, and a golf course and tennis club are nearby. No maintenance! Eskaton Village Grass Valley is maintained by Eskaton and the Eskaton-managed homeowners association. Residents need not be concerned with landscaping, lawn care, snow removal or exterior home maintenance and repairs. For apartment residents, interior maintenance is included as well. Service-rich retirement community and home ownership. Eskaton partnered with Treasure Homes, a Roseville-based home-builder, to construct the patio homes and sell them directly to Eskaton Village residents. An Eskaton-managed homeowners association provides exterior maintenance, emergency response, on-site shuttle and other services to homeowners. New residents may purchase homes from current owners. Apartment living. 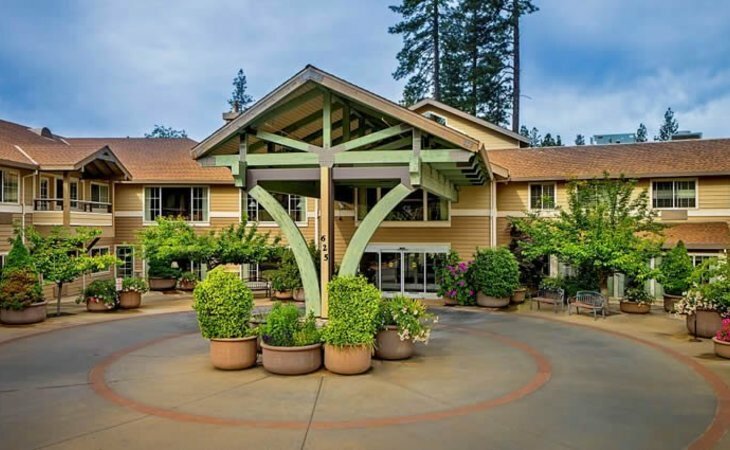 The Lodge at Eskaton Village Grass Valley offers 80 apartments that include a variety of services as well as rent and utilities in the monthly fee. Three floor plans are available. What should caregivers and potential residents know about Eskaton Village Grass Valley?